← Characteristics of latrines in central Tanzania and their relation to fly catches. 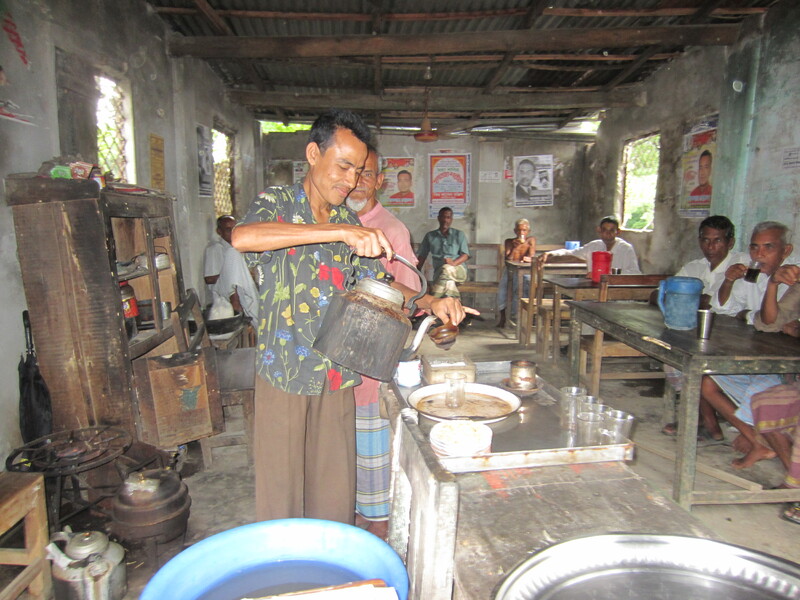 While on a mission in Bangladesh I visited a tea stall where I saw a lot of men getting their daily cup of tea. Tea stalls are a common phenomenon in Bangladesh, it is a place where people gather not just for tea, but to hang out and talk freely about whatever is important to them. Male field workers in the BRAC WASH programme have started visiting these stalls to discuss sanitation and hygiene practices. 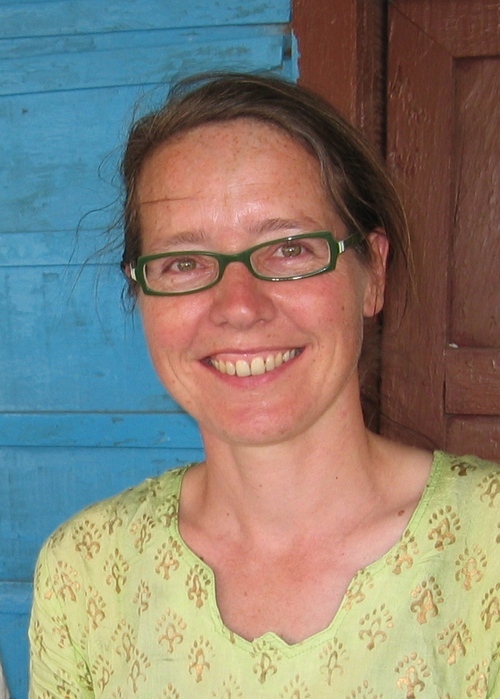 This idea was developed after the first monitoring results from the BRAC WASH programme showed that it is much more difficult to contact men than women during the regularly planned meetings in the village. I guess this is not new for those working on hygiene promotion: courtyard meetings are visited by women, but rarely by men. And when men come, they often do not stay the whole session. They are too busy with other things. There are people to meet, work to do, food to get. So, although it is very understandable, this is not helping to improve the sanitation and hygiene situation of the community. Results from monitoring also show that men lag behind in safe hygiene practices. A very nice paper written by Christine Sijbesma and Mahjabeen Ahmed on how this monitoring is done was presented by Mahjabeen of BRAC WASH at the international symposium on monitoring held by IRC in Addis Ababa in April 2013. Men lagging behind in safe hygiene practices, is that really a big deal? Yes it is, for both men and women because we know that unsafe hygiene practices by a few have an impact on the whole community. To be effective, hygiene promotion should involve each member in the community, including men. It also helps if a man in a household is supporting his wife and children with a decent and clean toilet, both financially and practically. So, where can we reach more men at times more convenient for them? In Bangladesh the answer is: at the tea stall! Armed with a pile of real-life pictures, male field workers visit local tea stalls to talk to men. In their ‘session’ they explain what the BRAC WASH programme is doing in their village and what health workers are discussing with their wives and children in cluster meeting sessions and household visits. The tea stall pilot started in November 2012 and a couple of weeks ago I had the opportunity to attend some of these of tea stall sessions with Sharmin Farhat Ubaid, senior manager at BRAC WASH who has set up this pilot with support of IRC International Water and Sanitation Centre. The stalls I visited were extremely crowded, and children were also very keen to see what was going on. While showing some pictures, the field worker discusses some key hygiene practices with the men. At the end of the session we asked the tea stall owner if these sessions are not bad for his business. On the contrary he laughs: “It’s very good for my business”. While we are leaving the tea stall, the children run back to their parents and we are heading back to the office. Just hundreds meter from the tea stall there’s another tea stall. Empty. I do not dare to ask if that tea stall owner is also happy with the tea stall sessions. From our short visits we have found that men are particularly interested in the new things that were shown and explained. For example: the picture of a syphon accompanied by the message that a hygienic toilet should have a water seal. 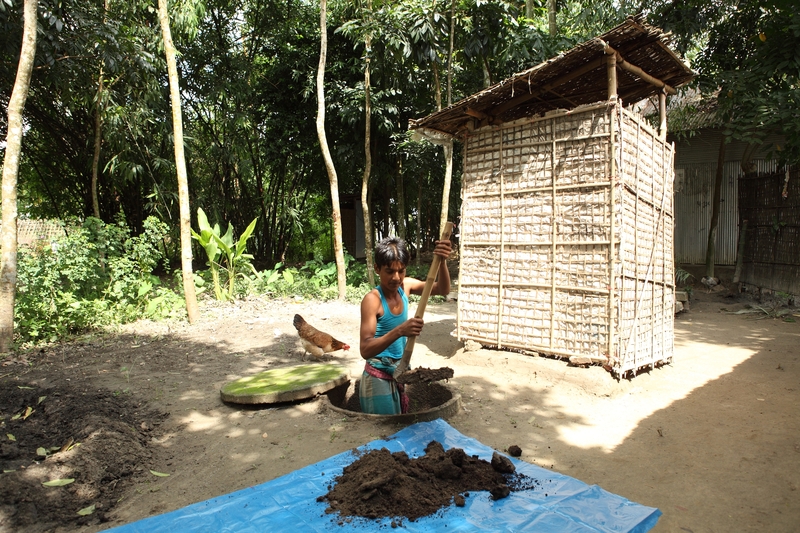 Or the picture of a man with a twin pit latrine, shovelling the content of the full pit on his garden: make money from your pit. This entry was posted in Hygiene Promotion, South Asia and tagged Bangladesh, BRAC WASH II programme, changing behaviour, IRC International Water and Sanitation Centre, men's hygiene, tea stalls. Bookmark the permalink.